Planning Typeracer’s Future: We Need Your Input! As Typeracer is moving forward, we realize the importance of gaining user feedback in order to help us develop a clear direction for the future. 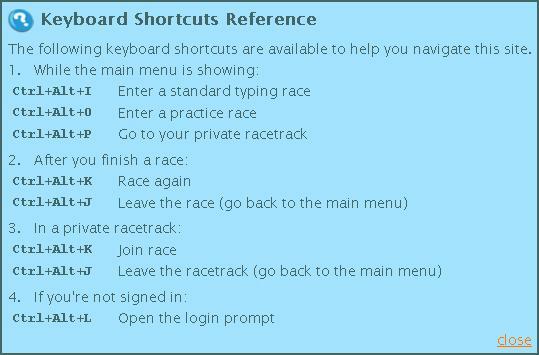 The better idea we have of what our racers want, the better we can direct our resources to improve Typeracer. So, today I want to do two things. First, I want to formally begin looking for volunteers who can help us improve Typeracer in the future by providing feedback and suggestions. What do you love about Typeracer? What could we do better? What new features do you want to see? If you are interested in giving us feedback about potential new features on Typeracer, and participating in discussions that will help us decide the future of Typeracer, please shoot me an email at david@typeracer.com. In the future, I might send interested persons about one email per month with ideas and questions we have, and you can tell us what you think. Second, I want to start this whole process off by posting a poll here on the blog, in order to get feedback about some of the ideas we currently have. Some of the ideas below are projects we are already working on, but many of them are just ideas we have considered. We want to know what is important to you so that we can use our time and resources wisely. If you’re interested, please look at the poll below and tell us which items you think are important.